There are a growing number of studies that have examined science learning for preschool children. Some research has looked into children’s home experiences and some has focused on transition, practices, routines, and traditions in preschool contexts. However, little attention has been directed to the relationship between children’s learning experiences at preschool and at home, and how this relationship can assist in the development of science concepts relevant to everyday life. In drawing upon Hedegaard’s (Learning and child development, 2002) cultural-historical conception of motives and Vygotsky’s (The collected works of L.S. Vygotsky: problems of general psychology, 1987) theory of everyday and scientific concept formation, the study reported in this paper examines one child, Jimmy (4.2 years), and his learning experiences at home and at preschool. Data gathering featured the video recording of 4 weeks of Jimmy’s learning in play at home and at preschool (38.5 h), parent questionnaire and interviews, and researcher and family gathered video observations of home play with his parents (3.5 h). Findings show how a scientific motive develops through playful everyday learning moments at home and at preschool when scientific play narratives and resources are aligned. The study contributes to a more nuanced understanding of the science learning of young children and a conception of pedagogy that takes into account the reciprocity of home and school contexts for learning science. 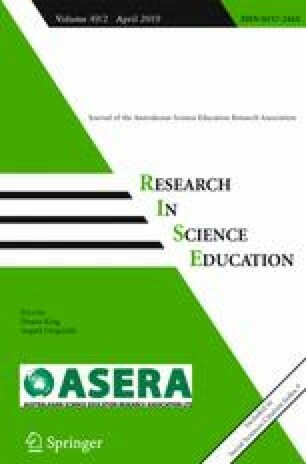 This paper was presented at the 2014 ASERA conference, Melbourne. Special thanks to the research participants of this study. A very special thank to the cultural-historical research community at Monash University for the constructive feedback in the presentation of this manuscript. The first author is a PhD student at Faculty of Education, Monash University and recipient of the Australian Postgraduate Award (APA) and the Monash Graduate Scholarship (MGS). The first author won the ASG (Australian Scholarships Group) 2016 travel grant for nominating this paper. Her study was situated in the broader context of an Australian Research Council Discovery Grant scheme (grant number DP130101438) project lead by the second author. The participants were drawn separately from the broader project for the purpose of researching the problem addressed in this paper. A special acknowledgement to field leader Sue March for overall project management. Research assistance was provided by Feiyan Chen, Yijun Hao, Hasnat Jahan, Mahbub Sarkar, Shuhuan Pang, Shukla Sikder, and Pui Ling Wong. Support from Madeleine Holland and Rowan Fleer-Stout with data organisation is appreciated for the broader project. Special acknowledgment of the staff and families involved in the study is made, as without their involvement new understandings would not be possible.